From left, Javier Villalobos and Tim Wilkins, candidates for District 1 commissioner in McAllen. 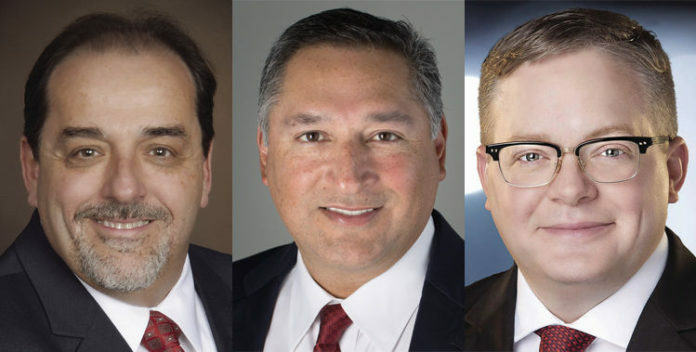 There were 1,330 ballots cast during early voting that ended Tuesday for the McAllen District 1 commissioner special runoff election between attorney Javier Villalobos and businessman Timothy Wilkins. The final day of voting is Saturday. Early voting this time saw 500 more votes cast than during the early voting period in January’s three-person special election. In that election, Villalobos and Wilkins received the two highest totals, but neither secured more than 50 percent of the vote, causing a runoff. During the runoff election, Wilkins spent $15,613 compared to Villalobos’ $4,015, according to eight-day campaign finance report filings with the city secretary’s office. The early voting period partially overlapped with the Texas primary election early voting period. District 1 voters can cast ballots Saturday, election day, from 7 a.m. to 7 p.m. at Gonzalez Elementary School. The winner Saturday will take over for Commissioner Richard Cortez, who resigned from the commission to run for Hidalgo County Judge.